Given City Tours Europe's multilingual multicultural structure, not only translation but also interpretation belong to our everyday life. A lot of our employees are either interpreters in training or professional interpreters; we do also regularly resort to freelance interpreters in Austria, Germany and all around Europe for our own business. The City Tours Europe team consequently owns solid inside knowledge in the field of interpretation and personally knows many interpreters - not only as an interpreter agency, but also from the point of view of the customer. We would like to share this knowledge with our partners and customers all around Europe by offering the services of the interpreters we work with - also for contracts outside our own fields, for instance for conference interpretation, seminars, lectures, etc. Considering our own business activity, we know a lot of interpreters specialized in economical interpretation, especially in the fields of tourism and culture. This is why we are the best partners if you are looking for an interpreter for a negociation, a consecutive interpreter for a symposium or a panel discussion, or a simultaneous interpreter for a congress or a conference on the subject of tourism or culture. Yet we can also provide you with freelance interpreters specialized in other fields, for example medicine, law or politics. In Austria, City Tours Europe has yet another specialization as far as interpreting is concerned: the interpretation to and from Austrian Sign Language (Österreichischen Gebärdensprache, ÖGS). 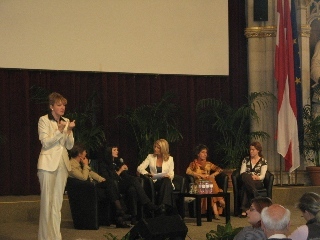 This can be explained by the fact that City Tours Europe itself employs deaf persons and that Austrian Sign Language is therefore one of the official working languages in our company: consequently, we have excellent contacts with many Austrian Sign Language interpreters all around Austria. - please remember to let us know the kind of interpretation service you need as well as the date and place where the service should take place. We will get back to you in very little time and let you know if we can provide you with the service you are looking for. If we do not have any interpreter for you at our disposal, then we will at least be able to recommend one of our partners who will be delighted to help you.